Are you a Magic player, looking for a place to play casual or competitive standard MTG? East Coast Gaming, on the border of Raleigh & Cary, is a great local game store that attracts players from the greater triangle area. 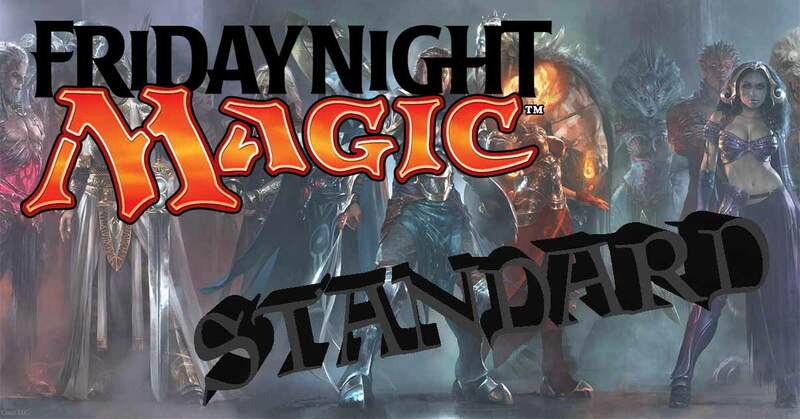 The standard format is one of the easiest format’s for new Magic players to play and East Coast Gaming offers casual and competitive events so players of all levels can play. We offer weekly events, including weekly standard events during our Friday Night Magic Events. We also have more competitive tournaments (open to all) that, from time to time, will offer standard format events. What is The Standard MTG Format? The standard format has changed over time, with the most recent iteration that became effective in 2018. Players are allowed to build decks, with a minimum of 60 cards and no maximum, from the last 3 or 4 “blocks” as well as the core sets released. Players may have no more than 4 of any individual card in their combined deck and sideboard, with the exception of basic land cards. As new blocks are introduced, older blocks start to rotate out. That means the cards that players can use for their decks are newer cards that are readily accessible by all. Unlike Legacy and Modern, there are often draft events in the Standard format. This is because unopened packs of standard cards are usually readily available and affordable. A Magic Draft consists of each player purchasing 3 booster packs, at the start of the draft, each player opens one pack and selects one card from the pack. The rest of the pack is then passed to a player to their left. After all of the cards have been selected, each player opens a second pack and passes the remainder to the right. This is repeated until all cards have been selected. From these cards, you build a deck and compete with the other players who selected cards from within your “pod”. Drafting allows players to build up their collection, compete, you can win prizes! For a full set of rules of the Standard format and a booster draft, click on the buttons below! East Coast Gaming is your store for buying and selling Magic cards, we carry a large supply of the standard cards you need to compete. We don’t have our entire selection of cards online, but if you want it, chances are we have it. Submit the form below OR call us at (919) 628-4383. We sell our Magic cards in store & on ebay (see ebay section) and we generally buy cards in store. For singles, please check out our buylist online. If you have a larger collection of magic cards, standard or any other format, we would love the opportunity to talk to you about it.